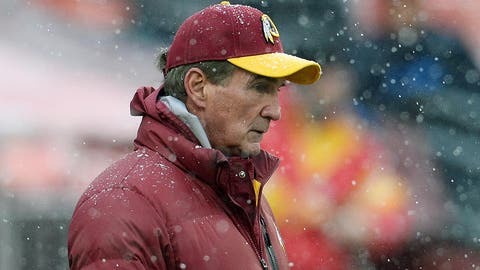 The only thing Mike Shanahan is trying to shut down is his job as coach of the Washington Redskins, FOX Sports Insider Jay Glazer told TMZ. Glazer says Shanahan sees the writing on the wall after an awful season and is benching Robert Griffin III because he wants to get fired so he can sit at home and collect his $7 million salary for next season. The benching of RG3 may have far-reaching effects across the entire NFL landscape, according to John Madden. The longtime coach and broadcaster took serious issue with Shanahan’s decision to bench his franchise quarterback. Madden believes that RG3 would be out on the field if Washington were fighting for a playoff spot, and that’s enough to convince him that RG3 should be out on the field now. "I do know this: when the going goes tough you don’t quit," Madden said via Dan Steinberg of the Washington Post. "And you don’t fold up. And you don’t go in the other direction. I think you stay with what you believe you stay with who you are, you stay with what you are. "We have an integrity piece here too," Madden said. "You can say well they’re 3-10, they’re out of it, so now they can do these things. No you can’t. This is still regular-season football. Draft order, that’s one small thing, but you still owe it to the people that are playing, that are still in the playoff picture. And when you can affect that and you don’t affect it with an all-out performance, then I think that affects the integrity of the game. Madden continued his assault on Shanahan’s decision, reiterating that Washington is facing somewhat of an ethical situation, and he disagrees with how they are handling it. For the good of the game, Madden believes that if Griffin is considered healthy and the best option for the team, then he should be out there on the gridiron. "I mean, you know it’s baloney," Madden said. "I like Mike Shanahan, and I’m not talking behind his back, but when you say something like that, you know that’s not right – you’re not going to sacrifice regular season games. There’s only 16 of them a year. You’re not going to sacrifice regular season games for an offseason program."